US, 2015, 93 minutes, Colour. Jason Lee, Kimberly Williams- Paisley, Josh Green, Tony Hale, Bella Thorne. Voices of: Justin Long, Matthew Gray Gubler, Jesse Mc Cartney, Christina Applegate, Kaley Cuoco, Anna Faris. This is not to exclude the fact that many adults probably find the chipmunks quite irritating, their voices, their behaviour, but would be prepared to put up with this for the sake of the children. Jason Lee, as Dave, is somewhat heroic as having appeared in all the Chipmunk films, being a great buddy with them, often finding them exasperating, as he does in this one, but eventually going to officialdom to properly adopt them! Kimberly Williams-Paisley? is a pleasant presence, although the chipmunks are not very happy with her and the prospect of David marrying. 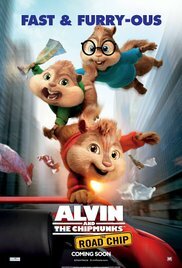 Her son Miles, Josh Green, is particularly obnoxious to the chipmunks, but, they save him when he is absent-minded in the street and almost knocked down by a car and gradually, they all bond in a common cause. The chipmunks misbehave at the opening of the film, throwing a party with the Chippettes and trashing Dave’s house. Well, not all of them, Simon is much better behaved than Alvin! Dave takes them to minigolf to meet Samantha and they later find a ring. He reprimands and goes off to Miami to launch a singer and her recording. The chipmunks assume that he is going to get married and, having encountered air martial, Tony Hale, Theodore petting animals loose on the plane and so clashes with them, they are ordered off planes and therefore have to go by road. There is quite some slapstick comedy with the air marshal. In the meantime, they have drugged three squirrels and dressed them up as the chipmunks to deceive the shortsighted neighbour, an amusing cameo by Jennifer Coolidge, to think they are still at home and to reassure Dave by phone when he rings. There is another amusing cameo with the director, John Waters, with some adult references to his films and filmmaking, like Pink Flamingos. As they go along the road, with Miles, they get to New Orleans and perform some songs there. Dave eventually catches up with them, they realise what is really happening, they return to Los Angeles for their adoption and there is happy ever after – at least until the next Chipmunks film.